Qi, Chi, Ki, and Prana. This shows that Qi is both derived from what we eat and from what we breathe. It also implies transformation in that a solid is being transformed into a vapor or to look at it another way, that a tangible substance is transformed into an intangible substance, that one form of Qi transformed into another. 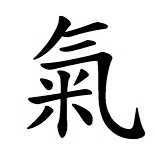 The concept of Qi is difficult to translate into English as a single word and is often left as is in books on Chinese Medicine but I think that the most generous is “energy.” This allows for the energy-matter equivalence as it is now understood by modern physics. This brings us back to the point that I would like to make. Our body is made of energy, of Qi. Each part of our body is essentially Qi that has consolidated into a particular form. This energy-body includes our organs, tissues, blood, nerves and all the various body fluids. These are the tangible forms of Qi. The intangible forms of Qi are only known by their effects. A. Movement: This includes gross physical movement, involuntary movements, like heartbeat and respiration, voluntary movements such as speech and eating, mental action like thinking, dreaming, and emotions, and growth, development, and aging. B. Protection: Qi buffers the body from stressors and helps maintain homeostasis. C. Transformation: The digestive, chemical, and electrochemical processes in the body. D. Stability: Qi maintains organizational stability. It holds the organs in place and keeps blood and other fluids in their vessels. E. Heat: Qi regulates our internal body temperature and its distribution. Our experience as humans agrees with these Qi functions in that we can often feel the flow of Qi. For example, when we are angry or embarrassed we feel the Qi move upward through our bodies to our head. When we are sad or afraid we experience Qi as an added weight. Also we can experience the flow of Qi as it connects to our surroundings, like when you can feel someone looking at you from a distance or when you enter a room of either happy or gloomy friends you can instantly feel the energy. As you can see, even though we often think of our bodies as a collection of individual parts, in essence what we really have is and Energy-body connecting us to all things. As Qi flows through our bodies consolidating to form tissues, organs, and fluids, and performing its various intangible functions it tends to flow like water through distinct channels or meridians. Qi flows in a continuous cycle nourishing and connecting all the body systems and tissues. The Chinese over the course of thousands of years of careful observation and clinical trial-and-error have mapped how Qi flows through the body. Disruptions in the flow of Qi either from an exterior of interior cause is experienced as dysfunction, discomfort, pain, or emotional upset. Exterior causes of disease include the weather: hot, cold, damp, dry, and wind. Interior causes of disease include the emotions: anger, frustration, joy, grief, fear, worry, over-thinking, and shock (sudden fear or surprise). Other causes of disharmony are: trauma, overwork, poison, parasites, sexual excess, and diet. This is what is meant by the word, “Holistic.” Holistic means viewing all things as part of a whole. All things, what we eat, the air we breathe, the environment, our surroundings, our emotions, our thoughts, affect our health. The Energetic System and Stress. Now let us examine the energetic system and how it relates to stress. Stress is any mental or physical challenge that activates the sympathetic branch of our autonomic nervous system. The sympathetic branch produces what is collectively know as the stress response of the General Adaptation Syndrome. These adaptations are an essential part of normal functioning as it relates to self-preservation. Initiated by nerve impulses from the hypothalamus. 1. Pupils dilate, improved distance viewing. 2. Heart rate, force of contractions, and blood pressure increase. 3. Airways dilate allowing for more rapid breathing. 4. Shift in blood flow priority away from kidneys, gastro-intestinal tract, and to heart, liver and skeletal muscles. 5. Blood glucose level increases. Initiated by hormones from the hypothalamus. 1. Sodium retention = water retention = higher blood pressure. 2. Increase in cortisol level = protein breakdown. Reduces inflammation but discourages wound healing. 3. Continued elevated blood glucose. Resistance stage cannot be sustained due to depletion of resources. 2. Suppression of the immune system. 3. Ulceration of the G.I. tract. 4. Failure of pancreatic cells which produce insulin. Although the stress reaction is an important adaptation which provides us with an important means of self-preservation in times of acute distress, if the stimulus is too strong or is prolonged or we don’t have the necessary energy resources, the stress adaptation can cause disharmony and disease. Gastritis, ulcerative colitis, irritable bowel syndrome, hypertension, asthma, rheumatoid arthritis, migraine headaches, anxiety, and depression. Combating the effects of long term stress. By activating the parasympathetic branch of the Autonomic nervous system (ANS) we can return our body to homeostasis. One way to do this is to remove the source of the stress. Since this is not usually practical, we need to find another way. Another way is to give the body another source of input by linking directly to the autonomic nervous system. We can do this by regulating our breath. Breath is the only function which is both a part of the ANS and is readily under voluntary control. By regulating our breath we can provide stimuli to the portions of the hypothalamus which regulates parasympathetic responses. Breath is the master of Qi. From a Traditional Chinese Medicine point of view, our lungs are the ruler of Qi. They regulate the Qi of the entire body. They keep the Qi flowing smoothly through the meridians and the tissues they supply. The lungs cause the Qi to descend, helping to relax the mind. The lungs are integral to the functions of digestion and blood formation. Benefits of meditative breathing techniques. The breathing techniques employed during meditative exercises such as qi gong, Tai Chi, and yoga has many positive effects. A. Facilitates the flow of lymph through the lymphatic system. B. Massages the organs of the digestive system. C. Temporarily blocks out the thought or emotion which is causing the stress. The 5 basic principles of Qi exercise. B. Posture. The position of the spine facilitates or inhibits normal Qi flow. C. Movement. Repetitive and slow, external or internal. D. Relaxation. A relaxed attitude reinforces the first three. E. Concentration. Focus and intent. Focus blocks out unwanted, unnecessary thoughts and emotions. Intent means that Qi will flow to where we place our attention. Qi follows the mind. A. Sit toward the front of the chair on “sit” bone, not sacrum. B. Feet should be flat on the floor, not crossed. C. Keep spine straight, head lifted, chin slightly down. D. Take one cleansing breath, in through the nose and out through the mouth as you circle your arms to the sides and rest them on your thighs, palms up. Close your eyes. E. Begin abdominal breathing through the nose. Fill your lungs from the bottom until they are about 75 % full. Empty them from the top, down. F. Focus your attention on the breath. Count slowly to four as you inhale, pause, count of four exhale, pause. G. Keep returning your attention to your breath. If your mind wanders, make a note of where it goes and then return to your breath. If you feel areas of discomfort, note them, use your breath to relax that area by moving the Qi from that area on each exhale. Wipe down the face five times, return hands to knees. Gently wipe the eyes with backs of thumbs, hands in loose fists, return to knees. Palms on temples, fingers pointing up, hold for five breaths, return to knees. Slowly open the eyes when ready.